Mario Party is a series that has been a party staple (and friendship ender) for 15 years now, and with each passing instalment we are treated to new boards, new mini games and new ways to play. 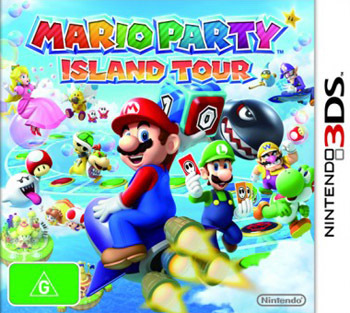 Mario Party: Island Tour for the 3DS is the latest instalment in the series and while it is a fun experience that keeps true to the Mario Party spirit it does suffer from its fair share of problems, namely repetitive mini games and frustrating board design. However if you are playing along with friends you will probably be having too much fun to really notice. 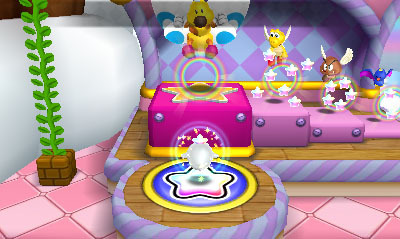 Gameplay in the Mario Party franchise has remained largely the same since the first game launched on the N64 back in 1998. Bringing the board game format to a digital platform was a great idea then, and it is still going strong today. The general gist of the franchise, is that you will join up with three other players (either AI or human controlled) and play through a series of board games. Each of Island Tour’s boards features its own gimmick and win conditions, which means that no two are alike. While this adds a bit of variety to the festivities, some of the level design can be frustrating and a few design choices completely ruin the experience. Banzai Bill’s Mad Mountain is an example of level design that quickly grows tiresome. The premise is that you are climbing up a mountain, trying to avoid the incoming Banzai Bills. You are able to hide in a safe-spot at the cost one step, or you can stand out in the open in the hopes of reaching the game’s checkpoints faster. The catch is that if someone rolls a “0” on the 6-sided dice, Bill will fire off and send everyone who is out in the open back to either the beginning of the board, or the only checkpoint in the middle. This risk vs reward aspect creates a really fun feeling of tension (especially because only one person can occupy a safe spot at any one time). However, the tension soon turns to monotony and dread, especially if multiple Bills are fired off in a row. I played this map three times, and on average a Bill was fired off every third dice roll. Not all of the maps are the same however, and some are genuinely fun. There are seven maps in total (6 to start with, plus the seventh you unlock from completing the Bowser’s Tower Single Player campaign), and three are really fun, while the other four can be taken or left. 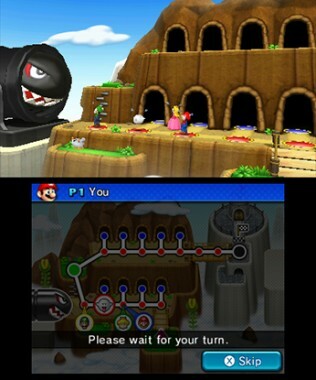 Perilous Palace Path is your standard Mario Party map; roll the dice and move through the board, playing mini games every turn and using items to help you along the way. It is great for newcomers to the series to get a grasp on how the game plays, but is also the one with the more replay appeal. It would have been nice to see some classic Mario Party boards make a come back, in the same way that the Mario Kart franchsie has revisited classic tracks of the past. Or failing that, at least a board that is circular and lets you keep playing rather than just stopping when a player reaches the end. So the boards are one thing, but everyone knows that Mario Party is really a mini-game collection. With over 80 mini games in Island Tour, you will be hard pressed to not find at least something that you enjoy. Sadly though, the minig ames often feel repetitive, with many of them having the same core concept with different skins. The best example of this is there are at least half a dozen “don’t fall off the edge,” style games. These are fun, but the overuse of them turns them into somewhat of a chore. 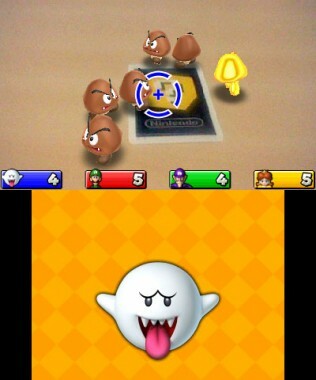 While many of Mario Party: Island Tour’s games rely on the old thumbstick and button control scheme, there are some that take advantage of the 3DS hardware to offer some unique experiences. One game has you colouring in fruits on the bottom screen with your stylus, while another will have you moving around and aiming (in much the same way that you would in Pokemon Dream Radar) to perfectly line up your arrow shot in order to hit the maximum amount of enemies. These experiences are few, but really do offer something unique and fun to the package. 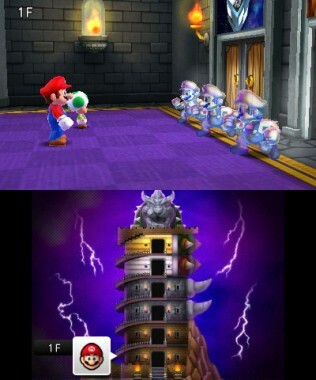 The game also has a new feature added – Bowser’s Tower. Basically a mini game collection, Bowser’s Tower has you rushing up 30 flights of stairs so that you can challenge King Koopa himself. Each floor has one of two mini games available to play, and completion will have you ascending the next flight of stairs. This is a relatively mundane concept, but is made so much better with the inclusion of the boss battles. Every 5 floors, you will encounter another Boss character from the Mario franchise’s past (like the ever-awesome King Bomb-Omb). These boss encounters take place in the form of a unique mini game, which quickly turn out to be the highlight of the whole Island Tour experience. King Bomb-Omb’s battle has you sliding panels left and right in order to complete a conveyor belt that will lead a bomb into a cannon, which will then fire at the explosive king. Once you have bested the boss, you will be able to play their game as many times as you want in the game’s free play mode. It also cannot be understated how awesome Nintendo is for allowing DS Download Play on this title. Up to four people can play over local wifi using the same game cart, and unlike titles that have used this feature in the past, you don’t get a watered down version of the game to play. Every board, every mini game and every character are selectable, and playable. It is a small feature but one that is definitely appreciated. 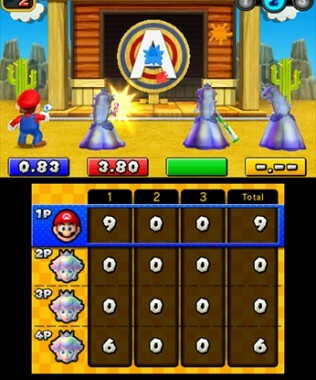 Mario Party: Island Tour looks like a Mario game, and that is great. Everything is very brightly coloured and has that signature cartoony-Mario look. This is a double edged sword in many ways, as it means that there isn’t a lot to make this game stand out from the rest of the franchise, and oftentimes the boards look like the over world map from a 3D Mario title. The character models are all fantastically drawn out and look beautiful. Mario and his crew all have a very iconic look and it is good to see that it is kept even in a party game. The 3D effect is also done beautifully here too. At no time during play did I see any hint of ghosting or double images. Sadly though, it looks great but doesn’t really add anything to the overall experience, and you wont be missing too much if you switch it off. The game’s audio sadly doesn’t feature the same level of quality as its visuals. While the music is very happy, uplifting and matches the theme of the board you are in – it quickly (and I do mean quickly) gets repetitive. You will hear the same few bars over and over again while you play. Added to this is the fact that all of the characters, while retaining their usual game voices, only have a few snippets of dialogue that they repeat no matter the situation. Just to compound things, Toad is the host of the game, so you will frequently hear his trademark scream whenever he needs to explain something new to the players. 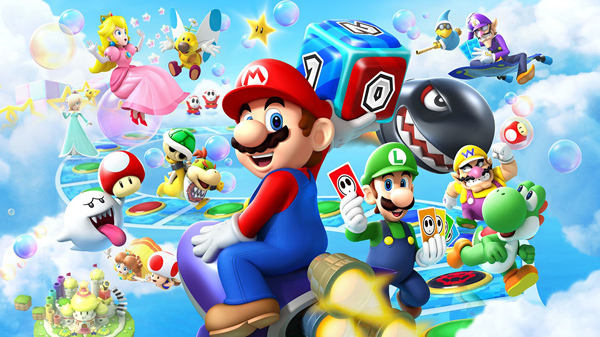 Despite its faults, Mario Party: Island Tour keeps the Mario Party spirit alive on the 3DS. With seven boards and over 80 mini games, there is something for everyone. The gameplay remains largely unchanged from the previous instalments, meaning that it is still as easy to pick up and play as ever. While the game at times suffers from some seriously frustrating board designs, sub-par audio quality and over-used mini game mechanics, if you are playing along with others then you will usually be having too much fun to really notice.